Letter from Prof. R. T. Sanderson to LP RE: thanks LP for his letter and for sending the letter for commemorating Jacob Cornog. 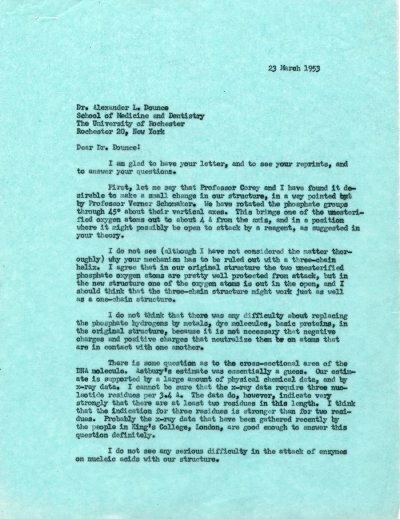 [Letter from LP to Prof. Sanderson March 11, 1953] [Filed under LP Correspondence: Box #379, Folder #1]. Note from Prof. H. D. Springall to LP RE: thanks LP for his letter regarding this theory of the alpha helix protein structure. Mentions his own intentions to write a book on proteins. Asks for LP's permission to reproduce some of his drawings of peptide structures. Suggests that they meet while LP is in England. [related letter from Prof. H. D. Springall to LP June 24, 1952, letter from LP to Prof. Springall March 30, 1953] [Filed under LP Correspondence: Box #367, Folder #6: File (Springall, H. D.)].